Hey now!! Happy day-after-iLoveFacedownFRIDAY!!!! Hope you aren’t sick of us yet, because I’ve gotten like 100million new emails of facedowns since the King5 debut! This fabulous facedown is sent in by my lil’sis Mary, in Vancouver how could you expect anything less than this GIANT TRUCK parked outside your gym?? 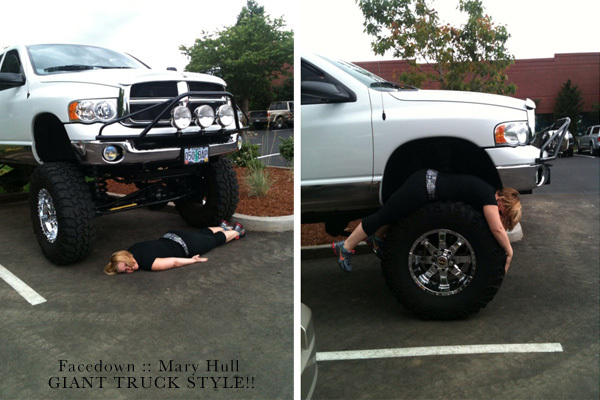 So, here Mary goes… FACEDOWN, GIANT TRUCK STYLE!! Thanks for playing the facedown game sister!! Heeeeeeey friends!! Last week Michelle & Stefan tied the knot… their girls were Sooooooooooooooooo excited, they went facedown!! 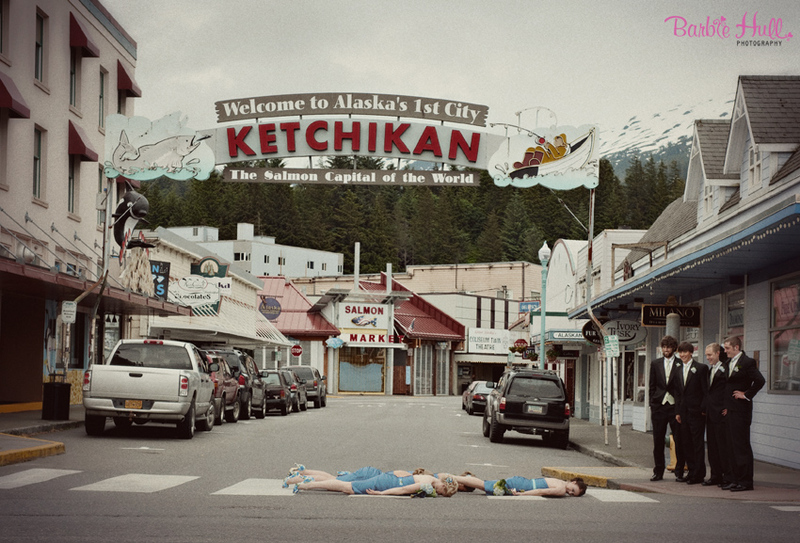 Facedown :: Nicholle, Amanda, Lauren & Hannah Photo by :: Barbie Hull Watchers :: GROOMSMEN!! Happy iLoveFacedownFriday :: GLACIER STYLE!! This week has been full of Mom’s & Kids and what better way to end the week than with a fabulous submission from my FAVORITE Mom in the WORLD?!!? Linda Hull (that’s my mom) and Barb Allen (two fabulous flight attendant extraordinaires!) 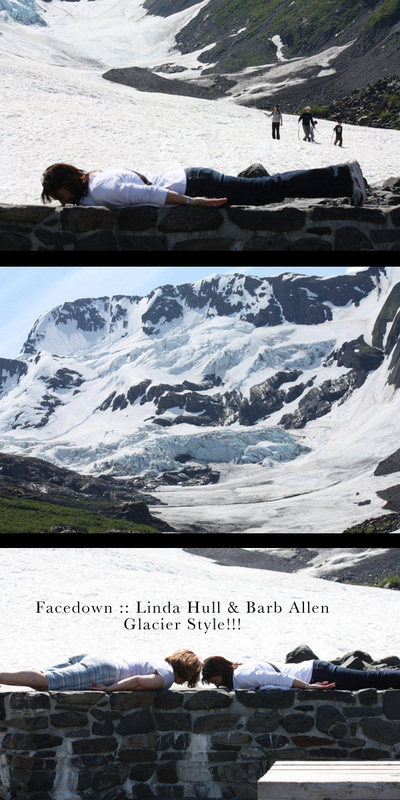 they went on a little road trip to Whittier and visited Byron Glacier… FACEDOWN style of course!! Thanks for playing girls and we can’t wait to see your next submission!!! Facedown :: Bored Kids at the PARK style! This sweet & superawesome family recently moved from Seattle to Prince Edward Island, Canada and we were watching King 5 and saw the facedown story! They were at a popular water park and it was cold, so instead of swimming… they FACEDOWNED!! Thanks to Jana & the kids for playing our game!! We can’t wait to see the next round!! Hey Now! Facedowns :: MOMSTYLE!!! Hey friends!! Thanks for all of the FACEDOWNS!!! You guys are the BOMBDOTCOM!!!! Nothing makes me happier than a facedown… and this one, most of all!!! My email pen-pal and bestbud’s (laurel mcconnell) Mama, Christine Hines!! FACEDOWN!!! Lets CELEBRATE!!! 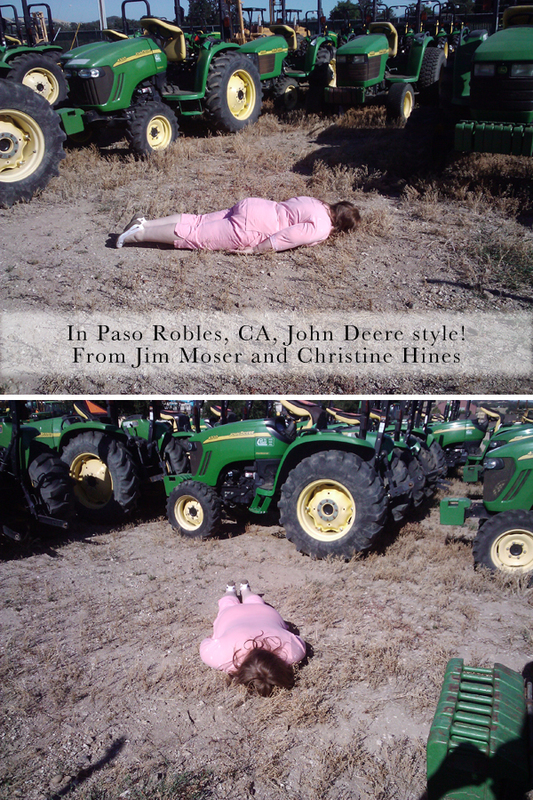 Happy iLoveFacedownsFriday everyone!!! 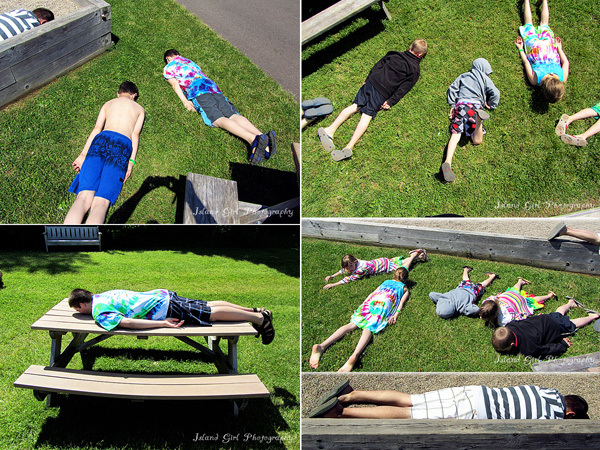 Its been one week since our awesome on air facedown/planking frenzy and things have been ROCKIN!! We’ve received facedowns and or Planks from all over the US!! Keep’em coming friends!! 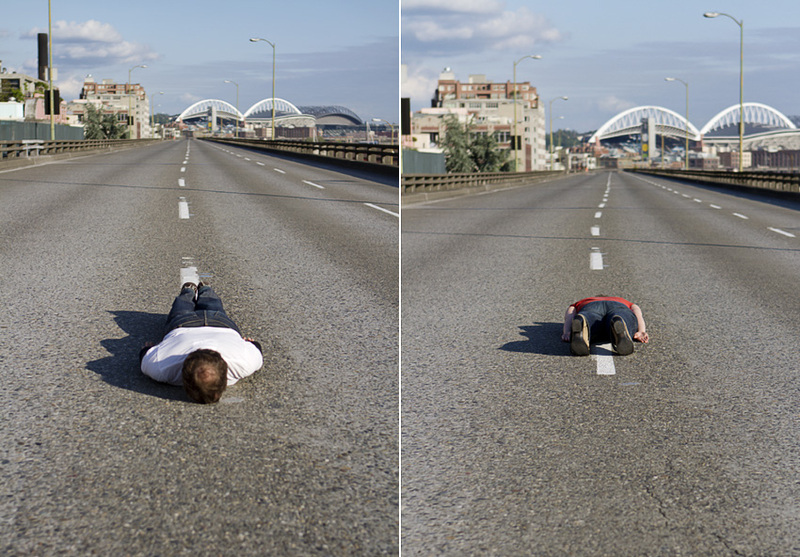 Taken on the 99 North Viaduct downtown Seattle and I am IMPRESSED!! Don’t act like you aren’t impressed!! We know you are!! Oh – and kids, don’t try this at home…. er… I mean on the viaduct!! I do believe these photos will be in the history books!! Facedown History!!! Photographers Do it Best :: FACEDOWN Poolside! Hey ya’ll hope you are enjoying this ROCKIN WEEK OF FACEDOWNS!!!!!! I mean one every day!?! I’m freakin out a little bit!! Ellen is TOTALLY going to have to invite Laurel McConnell, Jennifer MacNiven and me onto her show!! That’s right – I said it! So, here with us today is none other than John Becker – I can only imagine, that he was hanging out in his awesome backyard that has a POOL! (definitely not seattle!) 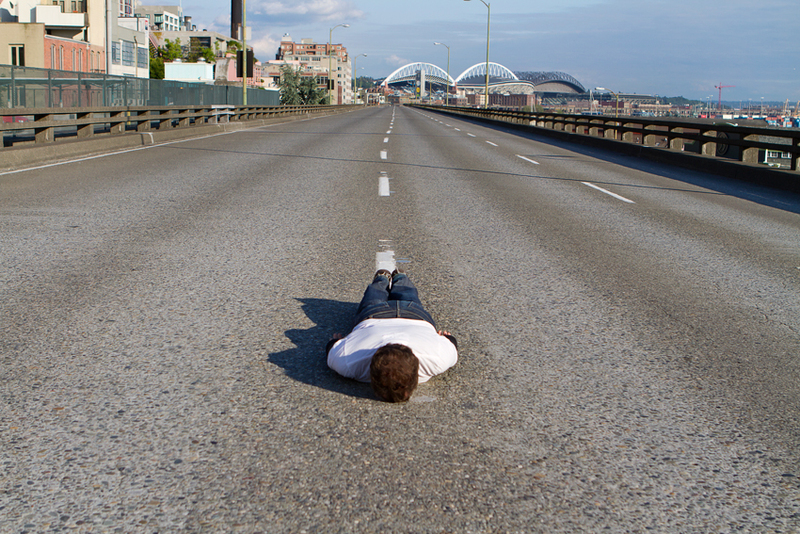 and thought to himself… I’m going to create the FIRST EVER CLONE FACEDOWN!!!!! Well – unless he has 7 twin brothers, he has clearly been CLONED!!! John, Thank you for playing our facedown game!! Your image is awesome and we hope you keep sending them in! !